I got an email a few days ago from a teacher in Australia called Rufus. She works with teachers in parts of the world where resources that many of us take for granted can be scarce, and where others that we may occasionally get our hands on are pure pipe dream. She asked me to contribute to some upcoming training she would be leading in Cambodia, with teachers whose local resources were limited and whose confidence in their own English proficiency may also be limited, and who may not have been fortunate enough to have received much in the way of formal teacher education in the recent past. In particular, she asked me what I considered my essential teachers’ toolkit: what, as a teacher, I considered a bare minimum of resources with which I could imagine working effectively with groups of students more or less anywhere. I recall that Jeremy Harmer tweeted out basically the same question earlier this year (it was something like: “what is the minimum you need to teach in terms of resources?“); at the time, I flippantly replied: “students“. While I still stand behind the sentiment, when push comes to shove, I can’t imagine working with no materials or resources to facilitate, if not mediate, learning work for any protracted period of time. I’d bet we all go into class with much more available to us than we realise, and, like Scott, most of us also always go in with something – even if it’s just a board-pen – or a post-it. But, as Madonna said, “we are living in a Material world” – and while I am not a Material Girl, I can’t ignore the reality that some raw materials are not only useful, but actually essential. After all, even Adrian Underhill’s impressive countermovement against published materials is predicated on having some blank canvas on which learners can paint their own masterpieces. So Rufus’ request offers me a chance to make good on my earlier sleight of hand while replying to Jeremy Harmer. it also offers me the chance to relive a childhood passion: creating emergency survival kits that fitted in a matchbox was something I used to love doing, and this is a natural professional extension of that. Naturally, I won’t get my toolkit into a matchbox, but it will still fit in there in spirit. Before I describe my toolkit, though, I should lay out some criteria for inclusion. I’m aiming for extreme minimalism here – and to be clear, I have never taught under circumstances where I would have neededto have such a kit with me. So for me at the moment, this is a thought experiment, but hopefully it may be of som epractical value to some teachers doing admirable work under more challenging conditions than I normally face. By this I mean small, easy to transport and light. It also means that you won’t get stopped at airports or by security because of it. Teachers aren’t exactly rich, and if you are worried about a toolkit like this, you probably can’t rely on a school or third party replacing stuff for you when it runs out or gets lost. This also suggests that most of the contents of the toolkit should be locally sourceable. All of my tools will be, with one possible exception. Teaching needs to be sustainable. and in part this means getting a lot of use out of limited resources. For teaching unplugged, this means squeezing every conversation, every text, every moment in class dry; for an unplugged teaching toolkit, this means recyclability and durability. Nothing disposable makes it in – or at least, just because it’s designed to be disposable doesn’t mean it will be treated as such! How many uses can you think of for a paperclip, for example? It’s designed to be a single function device, but with imagination it can serve a range of purposes. So should everything else in the toolkit. OK, cheating a bit here by counting these as one item, but a couple of pencils or pieces of chalk are small, light, handy, and extremely versatile. If I don’t have a board to write on, I might have paper, and failing paper, I could use either soft-lead pencil or chalk on most walls or flat surfaces. If push came to shove, I could use the pencils to write and draw in the earth! But writing is only one function, you may say, so what other functions can chalk and pencils serve? If you know Cuisinaire rods, you know how flexible variously coloured sticks can be. A few colouring pencils or chalk can serve at a pinch for the same kind of purposes. Dictionaries are worth their weight in gold. A good learners’ dictionary (such as the Longman Dictionary of Contemporary English, my current favorite) provides me with a vast range of support: a core lexicon, corpus-sourced examples of the langauge in use, definitions, grammatical information including collocation and colligation, picture support, style guides – in fact, good learner dictionaries almost make a reference grammar redundant. I would love to have space in my toolkit for a basic reference grammar, but something had to give and the dictionary won. But apart from research language, what can you do with a dictionary? It can serve as a screen, a stand, or (in large classrooms) as a useful way for me to gain a few inches height to be seen in the back row! I’d pack about 50 of these, in 5 sets of 10, sorted by colour. You can do a lot with these. For example, they would help manage grouping in large classes, so people could quickly identify their team-mates or the people they should seek out in mingle activities: just look for the person wearing the same colour safety pin. Or you could use them as place markers in board games. I know, I have not packed any board games, but you can make those yourself. Organise a washing line with some twine or string and you can use the safety pins to hang up student work in art gallery fashion. The students could unhang the work easily and go to talk about it with other people who have work with the same colour pin attached, or form pin-colour buzz goups with representatives from each colour group, as you wish. You can also use string to create designated areas in whatever space you have available, by laying ot out on the floor or by cordoning off. This could be useful for creating little “performance spaces” or for recreating other locations (for example, laying out a students’ bedroom or office, which then could be filled with other props in place of their furniture – other students act as delivery people while the learner describes where the things should be put (over an imaginary phone to make it trickier ). Speaking of phones, do you remember having “phone calls” when you were a kid by stringing two plant pots or plastic cups together with a length of string? While at the moment I exploit skype, flatrates and ubiquitous mobile devices to make telephone skills lessons more authentic, I could replicate the same sense of distance with these – and the connection might even be better! So that’s it – my suggested minimalist teaching toolkit. I’m sure I haven’t even begun to find out what could be done with even these poor tools, so now it’s over to you to help Rufus further. What other teaching uses for the items I’ve packed can you think of? What would you pack in your own survival toolkit, and why? Do you know of any other “teacher Toolkit” discussions like this online? If so, where are they? Go On, Be Generous – It’s Christmas! I’m totally with you regarding a tool for writing, a dictionary and the photos. Your delightful suggestions regarding safety pins (and the ball of string) would never have occured to me. I don’t think I’ve seen safety pins in use anywhere but on some clothes at the mall (for the tags)! And they come in colors?! a world map – a lot can be done with that, beyond locating places mentioned in class. Prepositions, comparatives and even colors (maps are usually colorful!) and many more activities. an egg timer, a small one with sand. ANYTHING (almost) can be turned into a game when you measure time. Enjoyed thinking abou this! Thanks! In my mind it makes sense but I don’t know if others will understand this…. Thanks for the inspiration. Glad you liked it, Louise – and thanks for stopping by. Hope the ideas keep coming – please invite any colleagues you have to stop by and contribute too! Apologies for addressing you by your surname in my last reply – I’ve amended that now! I had to think long and hard before rejecting a guitar from my list, David: much as I love mine, it seemed too single-function (though I am prepared to be schooled on that!) and too bulky – I’ve never liked schlepping it around, I have to say. I think a guitar would be a great thing to have around, though, so thank you for mentioning it. My Jew’s Harp – mine is a Vietnamese model called a Dan Moi, very small and elegant, and can actually double as a page holder! I think that the reflecting on what we need to survive in the classroom gets us to the nitty gritty of who we are as teachers. Have just linked to your post on the TeachingEnglish facebook page if you’d like to check there for comments. 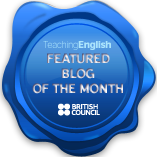 Have you aslo seen Rob Lewis’ take on the same theme http://www.teachingenglish.org.uk/blogs/rob-lewis/teacher-toolkits? Please feel free to post on the TE facebook page whenever you have anything you’d like to share. Hi Ann, thanks for putting together the counterpoint with Rob’s excellent article. I haev also subsequently discovered a section in a great little book by Duncan Foord and Lindsay Clandfield called the Language Teacher’s Survival Handbook, which I heartily recommend! -a set of 6 dice for board games, questionrevision ( a number =a question word), comparatives (each number can be sthg in a category to be compared), etc. -an inexpensive voice recorder (great for reporting back on what someone said and then checking against the original recording), getting students to listen to themselves, and bringing music into the classroom if you have a very small group.